The third book in Freeman Patterson’s internationally acclaimed series of instructional book on photography and visual design has now been completely updated and expanded to include technical guidelines for both digital and film photographers. From a moon rising over a winter landscape to a starfish in an intertidal pool or birds in flight, this guide demystifies the techniques of photographing nature. This edition features many new photographs from Freeman’s personal collection and extended captions that include valuable technical information and personal commentary from one of the world’s most celebrated nature photographers. 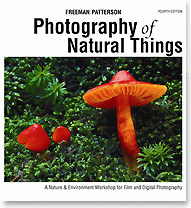 "Freeman Patterson has come up with another exciting book in Photography of Natural Things. Emphasizing that 'in nature, nothing exists in isolation', Patterson presents a complete approach to capturing natural elements through the camera lens." "Freeman Patterson's latest book - his third - is worth its price for the luscious, full-color photographs alone. However, those who enjoy the pictures without reading the text will miss a great deal." "An easily understood book that provides as much inspiration as it does technical instruction." "Patterson shares his vast knowledge of photography freely, clearly and interestingly."